Eastern Ghouta is an agricultural region east of Damascus city, home to an estimated 400,000 people. Since the beginning of the Syrian conflict, humanitarian access has been limited and the area has been classified by the UN as besieged in 2013. In October 2017, the humanitarian situation in Eastern Ghouta declined rapidly due to access restriction and increased conflict. Commercial deliveries to markets was not permitted in September or October, effectively halting the entry of goods from outside of the besieged area. Residents, lacking livelihoods opportunities, had to cope with exorbitant food prices by eating less and forgoing meals, and reports of widespread malnutrition among children surfaced in the media in late October. At the same time, conflict has intensified, despite the de-escalation agreements, with increased airstrikes and shelling of communities in Eastern Ghouta in October and November. This, coupled with dwindling medical supplies, has led to a severe health situation and a lack of access to healthcare for residents. REACH, in partnership with the Syria INGO Regional Forum (SIRF), provides monthly profiles of besieged areas in Syria, including Eastern Ghouta. REACH conducted additional interviews to shed light on this stark deterioration of humanitarian needs in Eastern Ghouta and highlight priority areas of response. According to REACH findings, movement of civilians remains severely restricted and reported as life-threatening. While commercial access has not been permitted in the past months, humanitarian convoys have managed to enter the area early November but goods remain insufficient. This has led to malnutrition and death due to lack of food, decreased health supplies and limited access to fuel. Access to water and electricity remains stable and sufficient, despite both water and electricity networks remaining unavailable. Additionally, although children were able to access educational services, schools were reportedly destroyed or damaged by conflict during October, which led to their temporary closure. Findings also indicated that high prices are limiting access to education, with children increasingly working to cope with rising costs. REACH will continue to assess the situation in Eastern Ghouta to monitor humanitarian needs and inform the response by UN Agencies and NGOs in this besieged area. If access restrictions on civilian movement, the entry of goods, and humanitarian assistance are not lifted immediately, the humanitarian situation will continue to drastically deteriorate, with major impacts on the civilian population living in Eastern Ghouta. 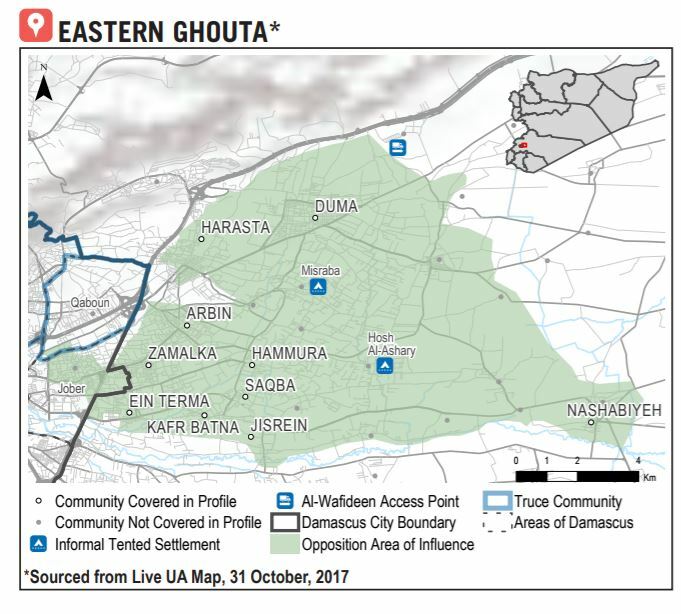 Access REACH Eastern Ghouta Situation Overview in full at this link.